Four new American farmers have found a farming home at a 30-acre farm in Lewiston, thanks to help from Maine Farmland Trust (MFT), Cultivating Community, and Land For Good (LFG). New Roots Cooperative Farm is a new enterprise founded by four graduates of Cultivating Community’s New American Sustainable Agriculture Program (NASAP). 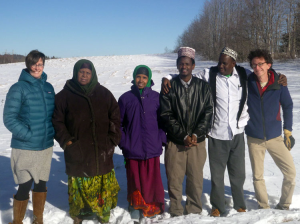 The four farmers are Somali-Bantu refugees who have been farming in the United States at NASAP’s incubator farm in Lisbon Falls since 2006. Considered graduates of NASAP, the farmers needed to find other land to farm to expand their own operations and to make land available for incoming incubator farmers. LFG’s Maine Field Agent Jo Barrett worked closely with Erica Buswell, MFT’s Farmland Access Program Manager, to plan and support the land search and, eventually, establish a stable land tenure situation. “We worked closely with MFT, beginning with creating interview questions for the farmers in order to understand what type of farm situation would serve them best,” says Jo. The approach replicates a successful model of partnership in which LFG and MFT have provided complementary land access training and support to participants in MOFGA’s Journeyperson Program since 2011. While Erica led the actual land search, Jo worked closely with Cultivating Community and the farmers to design and deliver workshops on Farmland Owner & Tenant-Farmer Relations, and on Components of a Lease. To further prepare the farmers to acquire land outside the incubator, Jo adapted an LFG tool to help the farmers compare various properties, and developed another to guide their first meeting with a potential landlord. Jo also reached out to potential landlords to help them understand what to expect when leasing farmland and to craft an agreement that supports their values and goals for their land. Concurrent to the land search process and readiness training, the farmers worked on the development of their business plans, as well as incorporating their farm business as a cooperative with the help of Cooperative Development Institute. Now that these farmers have decided on a farm, Jo will also help New Roots Cooperative Farm negotiate a lease. New Roots Cooperative Farm will break ground on their new farm this spring, where they will expand their successful vegetable operations and try their hand at raising goats and chickens in Maine. “I love this part of the job, seeing passionate new farmers get on land,” explains Jo. “The education, training and support Jo provided in this case is great example of how we partner with other advisors to improve farmland access, affordability and security for all types of farmers,” added LFG Executive Director, Jim Hafner. Read more on blogs of Maine Farmland Trust and the Cooperative Development Institute.